Just a quick update for the SSI family… over the long holiday weekend The Space Studies Institute sure got some things done. After wrapping up some must-do general office busywork last week we pulled out the Space Based Solar Power/Solar Power Satellite collection cases and got back into organizing for eventual public release. 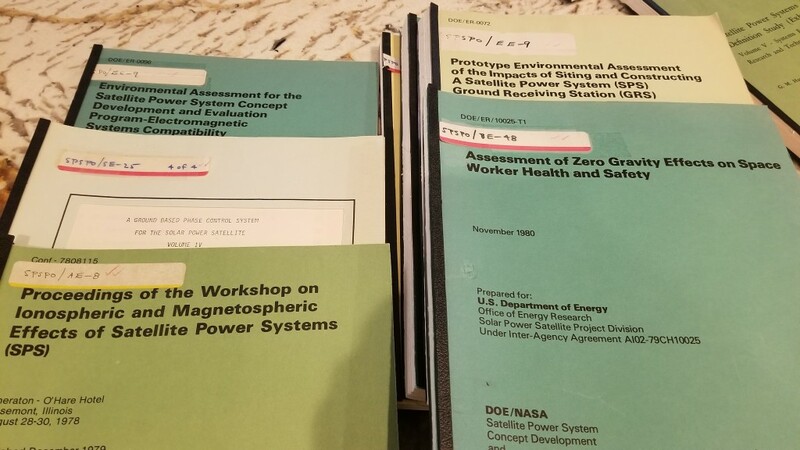 In the 1990’s The Space Studies Institute was selected to be the repository of the NASA and Department of Energy SPS documentation and over the years many researchers had visited the Princeton SSI offices to pour over these priceless volumes. When SSI moved main operations to the Mojave Air and Space Port this large, heavy collection was put into storage for a time when the budget would allow safest shipping and that time arrived last summer when an SSI Senior Associate contributed their time to do the packing and paid for the transport to the West coast. On Friday we put much of the collection in chronological order and got a chunk of the Velobound reports digitized. Hundreds more, those in spiral and staple binding and in cloth-glued format are still to come and thanks to an SSI SA’s loan of a wide format book scanner they will be done as we are able. 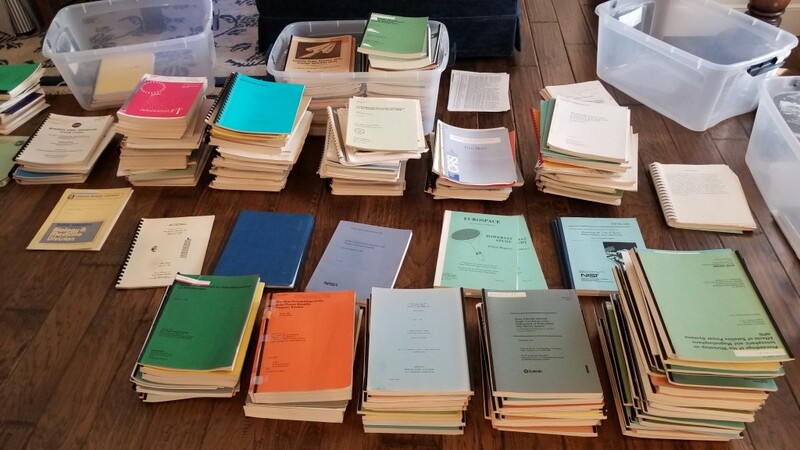 The scanning is just the “easy” part, after that each page will be individually enhanced and each report will be put into separate PDFs with hyperlinked tables of contents and hierarchical bookmarking to make life easier for future SPS researchers. That was Friday, on Saturday an SSI Alumnus and I met up for a nice lunch just to talk Space and Options and there just happened to be a very large piece of paper with us that has been in need of digital cleaning. Upon seeing the white page with blue sketching he offered to see what he could do to bring a bit of Space History back to the light of day – and he also renewed his SSI Senior Associate pledge, which is is very appreciated and just makes us all more comfortable when we allow “insider” information out of the SSI physical archives. We very much look forward to seeing what he comes up with and hope that in time we will have something very nice to show in an upcoming SSI Associate members-only newsletter. Over 20 thousand good people saw that little post, it was shared 200 times, Liked by over 850 people, Loved by 65 and even given “Ha-Ha” by 11 :-). 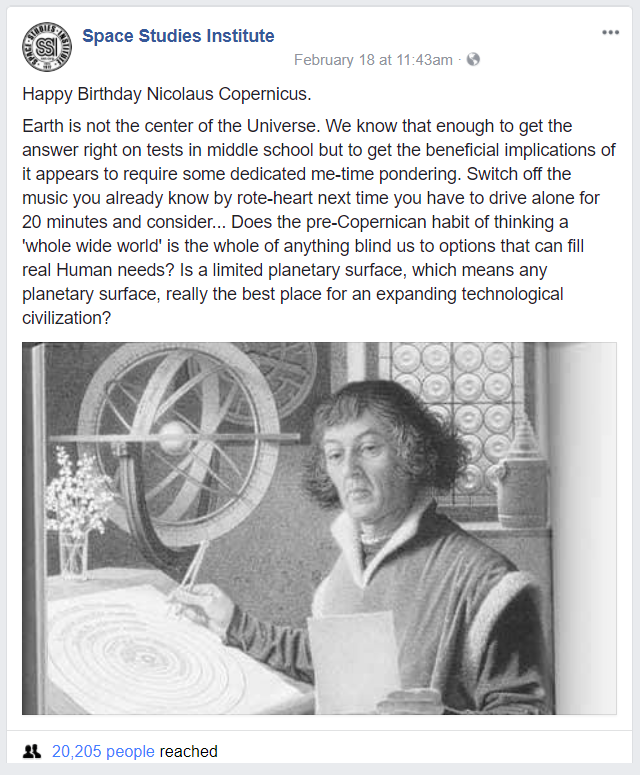 There were a lot of comments, some quite interesting from folks who don’t normally have Space technologies in their day to day work, and while some of us might not share all of the opinions that everyone chose to expose publicly, it all makes for very good research. The Space Studies Institute is about using the Energy and Material Resources of Space to help regular people everywhere they chose to live – ALL regular people, not just those those who see things exactly as we do right now. So if you check that post’s set of threads and maybe are considering joining in, we know that you will take a breath and remember that everyone is entitled to an opinion and arguments don’t help anyone – what helps Everyone is working to show by deed where real positives can be made. There’s an old truism that someone paraphrased at the Estes Park Advanced Propulsion Workshop: “People will argue forever that something is impossible… but when a cannonball is sitting in mid-air right before your own eyes, it is hard to deny it.’ The contributions and tax deductible donations of our Associates work to make people see that “Impossible” things with potential benefit sometimes just need extra help. We sincerely appreciate all of your help and we look forward to updating you on the ongoing projects mentioned above and the others that truly deserve your full support.